Welcome to Super Delegates, a bi-monthly column released on Tuesdays and are done in part to recognize politics on film, specifically in regards to Oscar-nominated works. With this being an election year in the United States, it feels like a good time to revisit film history's vast relationship with politicians of any era and determine what makes them interesting while potentially connecting them to the modern era. The series plans to run until the end of this 2016 election cycle, so stay tuned for every installment and feel free to share your thoughts on films worthy of discussion in the comments section. The job of the president is tough. Whether good or bad, every decision that one makes during a four year term will have a great impact on American history for the immediate future. It could be simple things such as passing laws that create tax hikes, or scandals that alter the public's perception of government. Whatever the case may be, it is difficult to have a fond appreciation for the president in their own time. One can consider President Harry S. Truman among that list, especially with his detractors critiquing every small move. He was the president who suggested that "The buck stops here." He was a man for the people, but he wasn't afraid of making tough decisions. He was the president who ended World War II by dropping the bombs on Hiroshima and Nagasaki, Japan. It is difficult for audiences decades later to consider Truman a "bad" president all things considered. Yes, he made mistakes. However, he also did some great work to keep the country stable. It wasn't going to be easy to follow Franklin D. Roosevelt, who pretty much helped America out of the Great Depression. However, his famous whistlestop campaigns where he rode a train stateside and campaigned to the people made him an endearing figure with off the cuff remarks coming at every turn. If nothing else, he as an eccentric president worthy of reconsideration, which would happen as the 70's rolled on and the play Give 'em Hell, Harry! premiered with James Whitmore as the sole actor in a story of Truman's political career. It can easily be summarized as a one man show despite attempting to be more than a monologue. With integrated conversations with various figures both in his political and personal life, Whitmore's performance covers every facet of Truman's ideals. He definitely embodied the passion of justice. He dreamed of making the country a better place. With his sly remarks, he quickly connects with the audience and makes the almost two hour journey into something grandiose yet intimate. The vision of one man onstage recounting his life captures the feeling of a lone hero who is forced to do tough decisions. To suggest that additional actors would help is to deny the power of theater. The story works because of its limitations. Truman was in some ways limited as well, and it comes through in his performance. He is able to break barriers and make the audience see things that aren't there. What gives Give 'em Hell, Harry! a particularly strange reputation is that it is a live production. There's no cinematic merit to what is shown. 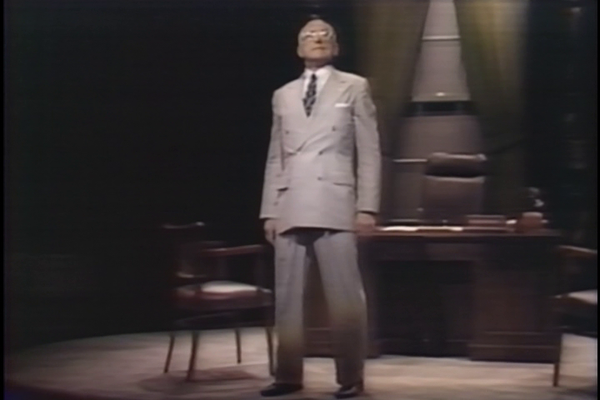 The camera work is at best standard shots to emphasize Whitmore's various stances on stage. Yet the film remains one of three to have Oscar nominations for its entire billed cast (the others being Who's Afraid of Virginia Woolf? and Sleuth). It doesn't make sense, especially since the show is built more as a theatrical show that would land Whitmore a deserved Tony nomination. An Oscar seems unfathomable, if just because the film isn't cinematic. It's one man performing a minimalist story. What gives him the edge? Whitmore's Truman has the gift of not having to rely on supporting cast. What he does is rely on his own words done in a dizzying yet charismatic fashion. He has a playful tone that draws the viewer in and asks for compassion. It is the work of theater that frankly should be captured more often. The reason that Whitmore got nominated is clear. Give 'em Hell, Harry! does not work with additional players. It by proxy becomes a boring and conventional story. This needs to be a live production, as to even set up shots would add a farcical element. It is by no means great cinema, but it does capture a great performance worthy of any acclaim that would be thrown its way. The film also had the impromptu goal of being released during the middle of the Richard M. Nixon administration's control. With audiences already tense over the president's problematic decisions, Truman embodied a nostalgia and belief that politics could be better. Give 'em Hell, Harry! goes so far as to decry Nixon in its closing moments, suggesting that the recently deceased Truman would despise the more recent president's ideals. It is a moment that got a triumphant cheer from the live audience, and one meant to cause a certain reevaluation of recent history. It was to suggest, having followed over 90 minutes of endearing moments, that Truman was actually a great president both as a personality and as a leader. It may seem obvious, but the magic of performance causes the farewell to feel bittersweet. They don't have leaders like Truman anymore. The 2016 election is difficult to fully understand the nostalgia, as it feels somewhat connected to the past. Former President Bill Clinton has been on the trail with Democratic Party nominee Hillary Clinton, causing memories of his own eight years in office to come up. The Republican Party is reliant on calling itself "The party of Abraham Lincoln," suggesting a certain moral superiority. Traces of Republican Party nominee Donald Trump's slogan "Make America great again." recollects the running slogan of Former President Ronald Reagan (no, seriously. It does). There is a nostalgia to have modern politicians be better leaders in the vein of figures long past. There's comparison to the modern leaders, in this case President Barack Obama, that vary on quality. Everything is compared to the past, and only then does the overall impact make any sense. In the modern age where social media is a main draw for most younger voters, politicians have done their best to adapt to changing trends. Truman was limited to travelling across country to get the word out. Nowadays, the word can get out online in a matter of seconds. It has proven to be both good and bad, causing the personal image to be more exploitative than it ever had been in the past. Criticisms of politicians, no matter how minor, are allowed to be voiced more freely and massively. The days when Truman's criticisms were reduced to popular media are gone. Now it's about the immediacy. Each candidate has their appeal to whomever their demographic is, but they both embody a nostalgic ideal of doing better than their predecessors. The only difference is that all five living presidents have endorsed Clinton and shoved plenty of hyperbole into their rally speeches. This is far from the idea of Truman criticizing Nixon's incompetence. The public's interest does suggest that this is the most divisive election in recent history. Even then, the nostalgia for a better America remains strong. Give 'em Hell, Harry! isn't one of the great works of cinema, though it does have one of the best portrayals of a president often buried in history. He was a man just like anybody else. He wanted to make the country strong and show that positive change was possible. He was seen mowing the lawn, running the country, and even having personal chats with his family. It may be difficult to agree with him on everything, but it does paint a portrait of a man whose reputation would be restored to a positive status. It's still speculative if he was that great, but he definitely left a lasting impression, as the next president is likely to do when they become a figure stuck in sticky situations that history may judge them critically on, but will inevitably come back to be seen as a substantial impact on the country's long term success.